Occupations: Creative Co- Founders of Half Hippy, an eco-conscious natural beauty and body brand. Marian has a background as a makeup artist and Upahar in business development and marketing. 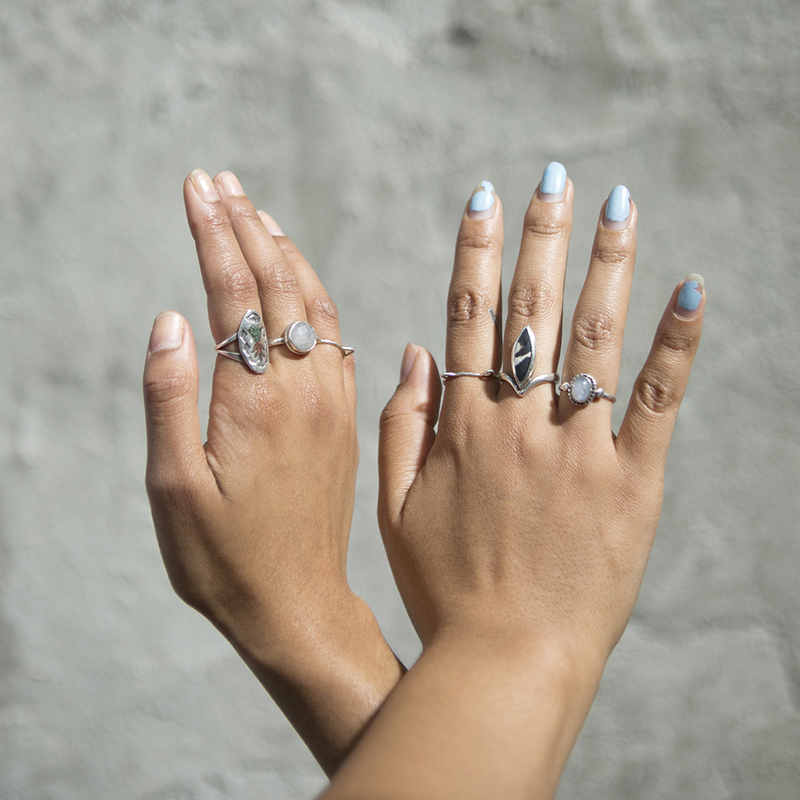 They both come from a creative arts background and really enjoy running every aspect of Half Hippy from creating editorial content to the nitty gritty details of making the product itself. How was your brand created: Half Hippy began as a passion project for us as we began exploring natural alternatives for our bodies. In our mid 20’s, we both struggled with acne and different health issues and started to experiment with natural recipes on our own. We ended up doing a lot of research and testing out natural alternatives to heal ourselves. After discovering the wonders of oil cleansing and magic of natural plant based beauty, we were hooked and ready to share our pocket of knowledge with the world. That is how Half Hippy began as both a blog and a source for us to connect with the green beauty community. We also wanted to create a website and Instagram account that made natural beauty sassy and fun with the overarching philosophy of BALANCE. We are super excited for this journey and being able to do what we love. All of the products, especially BaeBrow™ and Pit Police™ are our daily staples. You’ve got to add the pow to those brows and say bye to B.O boo! It’s our daily arsenal to conquer the world. These two are our favorite and were created as a necessity to natural, yet very effective alternatives for our daily routine. 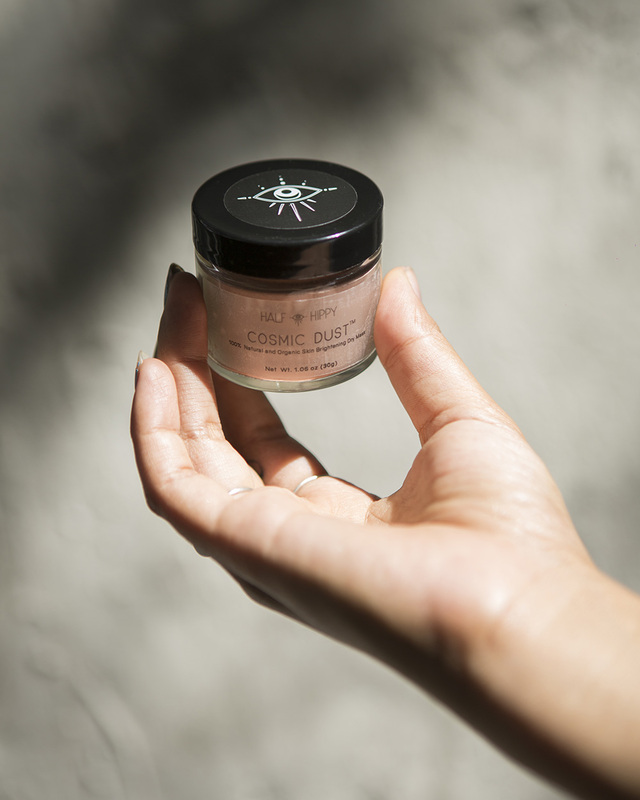 In addition, the Cosmic Dust™ dry mask has so many great properties like rice powder, maca, beetroot, and aloe that is a great weekly mask to treat yourself and your glow on! We officially launched our beauty brand in September. Products can be purchased on our website and we will begin selling in some smaller stores as well. We are also doing pop-up shops in NYC. What advice would you share with someone who is interested in transitioning into a more holistic and green, Half Hippy lifestyle: We encourage people to experiment as they transition into a more greener and cleaner lifestyle. Everyone’s body, including their skin type, is different and it requires a trial and error process along with guided information to choose what meets your needs. We say the quickest way to eliminate toxic nasties is to shop organic, cut processed food from your diet, and try to eat natural forms of sugar such as fresh fruits or even honey. We are all about balance so don’t be afraid to treat yourself to life’s little luxuries once in awhile and even make time to let loose at happy hour. As long as you balance things out with a mostly “healthy” diet and yoga or the gym, life has a great way of taking care of the rest. Living a holistic and natural life doesn’t mean following stringent rules 24/7, it means prioritizing holistic options and higher quality of ingredients whether it’s for your skin or body. Be patient with the changes you make because it is all about creating a lifestyle that you can enjoy and not just some dietary fad. It is better to eliminate unhealthy items slowly then to just cut it all at once. We both have a sweet tooth, and we definitely indulge it with dark chocolate or even straight up donuts. And one of our biggest weaknesses has got to be fries! We haven’t cut treats like those out completely, and don’t plan to anytime soon! But we will say that once you incorporate plant based foods for both your beauty and body needs, you’ll definitely notice that you feel overall better or that you’re even rocking this green goddess/god glow! The effort will come naturally. Upahar, what are some of your ride or die beauty products: I absolutely love Alima Pure and use their loose powder satin matte foundation and blush powder everyday. They have an array of options to match your skin and the best part is that is it is all natural without any chemical nasties. My number one natural beauty product is Zuzu’s eyeliner because I just can’t live without my wing tip and finding a green beauty alternative made me super happy! Marian, since you are a makeup artist, what are some staple green beauty items in your kit: For a setting powder, I can’t live without arrowroot powder. Not by any particular brand, just as long as it’s organic. It is microfine and sets completely transparent, even on darker skin tones. RMS also has amazing lip/cheek tints that give the perfect hint of color and concealers that look sooo seamless and natural. What’s one beauty brand that you think everyone should know about: Alima Pure is definitely on the top of our list. It met our olive skin foundation match needs that can be a tricky yellow color during the winter while still being super gentle on our skin. Favorite green beauty dupe: We absolutely love arrowroot powder. It literally can help you with your head to toe beauty and skin woes. We use it as dry shampoo, setting powder, and even chaffing issues (yasss those thigh issues). 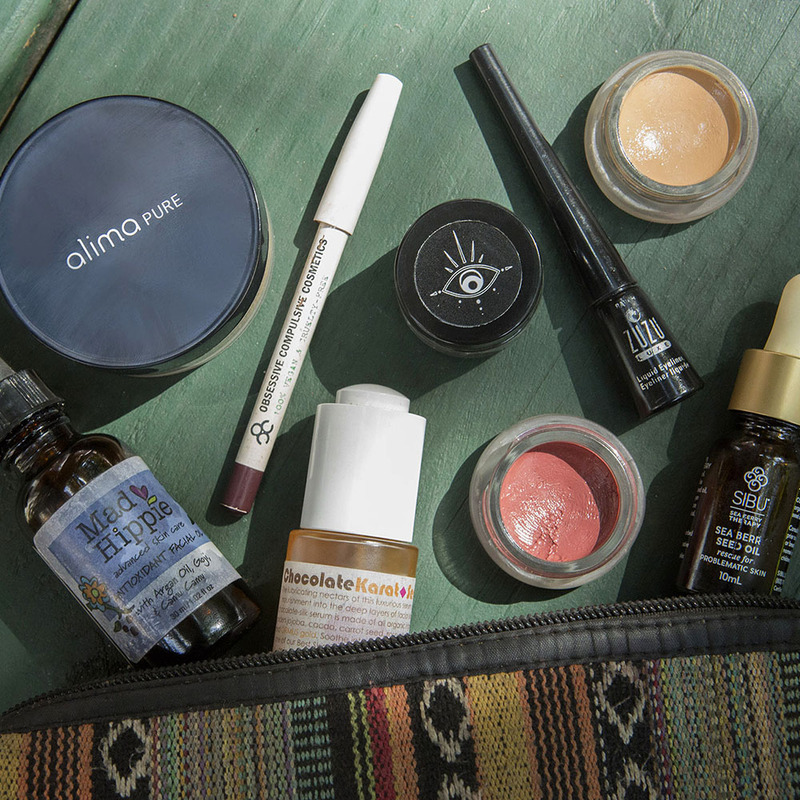 Skincare favorites that work: We can’t live without Nutiva Hemp oil for our daily oil cleansing and makeup removal routine. Upahar usually finishes her nightly routine with either Mad Hippie’s Antioxidant face oil or Sibu Sea Buckthorn oil, both are truly amazing and packed with nourishing benefits for your skin. Marian loves the Chocolate Karat Serum by Living Libations that is packed with cocoa goodness. She also slathers castor oil on her lashes every night to stimulate growth and keep em’ conditioned. Hair care must haves: We like to keep our hair care routine pretty simple using as minimal shampoo as possible. Upahar uses Jason’s paraben & sulfate-free shampoo, while Marian uses very little shampoo and sets her hair with a homemade spray made of rosewater, sea salt, water, and coconut oil. We love oil if it isn’t apparent by now and definitely treat our hair with coconut or rosemary oil massages. Favorite Beauty Tip/Secret: Sleep and lots of water. Ain’t nothing new, but it honestly makes a huge difference in how you look and feel. Favorite way to treat your self: We definitely love a good happy hour and night out in town with a lot of dancing and naturally that will be followed with pizza (the struggle is real). To balance out our mind and body especially when we are stressed, we love going to yoga to reset ourselves. Why do you think self-care is so important: Self-care is not just a routine, but a way to prioritize yourself above all. As women and entrepreneurs, we tend to be very giving and nurturing of others, but sometimes giving yourself that love can be easily lost so it is extra important to fit in some self-love. Life is hectic and living in a crazy, yet beautiful city like NYC makes it harder for us to find the time. Most days it is definitely a struggle, but we highly believe that both our mind and bodies need to be nourished with self-care in order for us to be our best in all areas of our lives. Whether its taking time to go to a yoga class, taking a bubble bath, ordering in with netflix, slathering some your favorite mask on your face or meditating, you have to make yourself a priority. Marian and I made a trip to Nepal last fall and had amazing time playing dress up with my grandma and eating her delicious meals. She also made sure we had lipstick on and that we were presentable at all times cause she’s a big believer of putting your best self out everyday without ever having to compromise your personal identity no what what age or lifestyle you live.